The present research focuses on the means in which daylighting can be incorporated as performance in an unfired monolithic clay construction. The need of light can be scientifically quantified in order to ensure a standard human comfort in daily activities, however it also represents a deeply personal and complex need that is not objectively quantifiable. 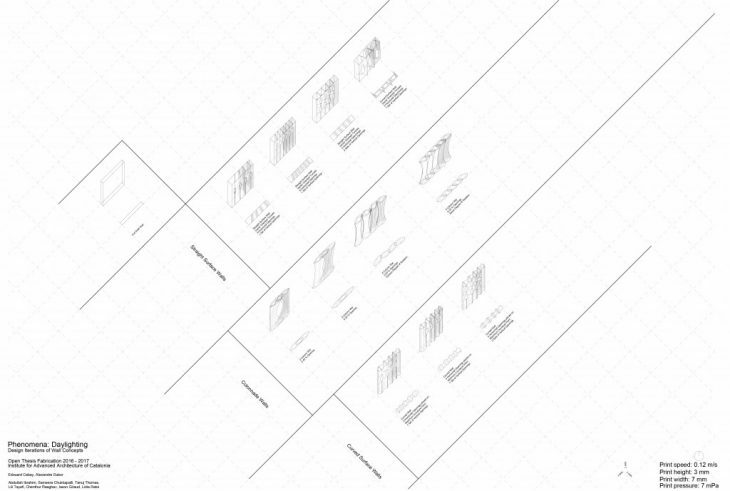 Within this framework a small part of this theme is explored, focusing on considerations seen through the relationship between current technology, standard architectural needs and intimate – or subjective – needs. This research is done from a digital, theoretical and physical perspective. Beyond establishing a 3D Printing language that allows construction with openings, an alphabet of design parameters which was then subjected to digital and physical simulations, the research methodology was divided into two phases of analysis: one that focused on traditional, standardized means of ensuring habitable architecture, and the other focusing on more philosophical and psychological mannerism, by analyzing light linked to human emotion. These features will form a number of issues to be considered in the future development of TerraPerforma. 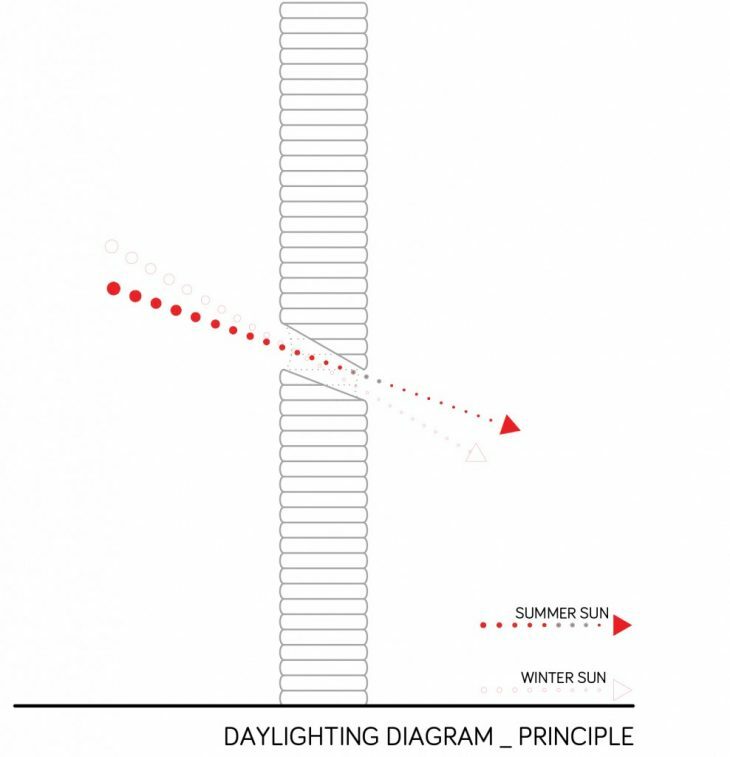 Daylight is the combination of all direct and indirect sunlight during the daytime. This includes direct sunlight, diffused sky radiation, and both of these reflected from the Earth and terrestrial objects. Sunlight scattered or reflected from objects in outer space is not generally considered daylight. Thus, moonlight is never considered daylight, despite being “indirect sunlight”. Daylight is considered a basic human need, due to the psychological and health related issues that can be caused by the lack of it (which are to be detailed further more within the present research ). There are very few types of architectural structures that, due to the specific function they host, do not require daylight, such as cinemas, auditoriums, bunkers etc. 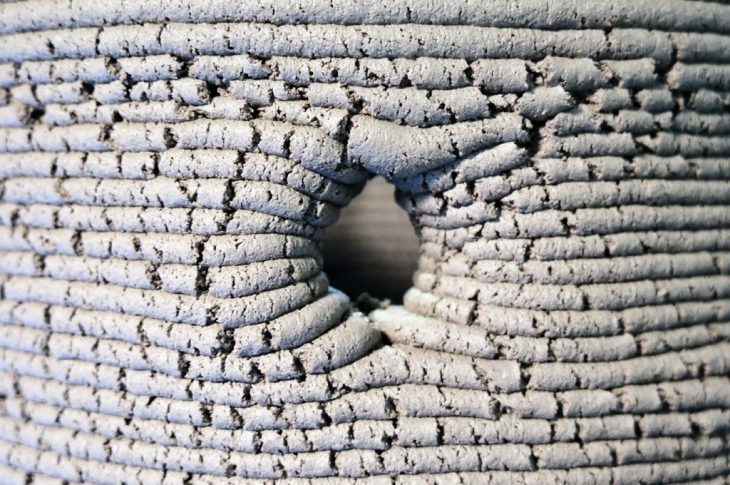 However, when applying of 3D Printing technology the creation of feasible structural elements which present cavities is a real challenge. Providing a standard amount of lumen intake is approached both with 3D Printing reasoning as well as ensuring the maximization of daylight potential, through the integration openings within a robotic printed geometry. The work methodology was divided into 2 areas of research. The first area of interest revolves around the question of integrating openings within a robotic printed geometry. 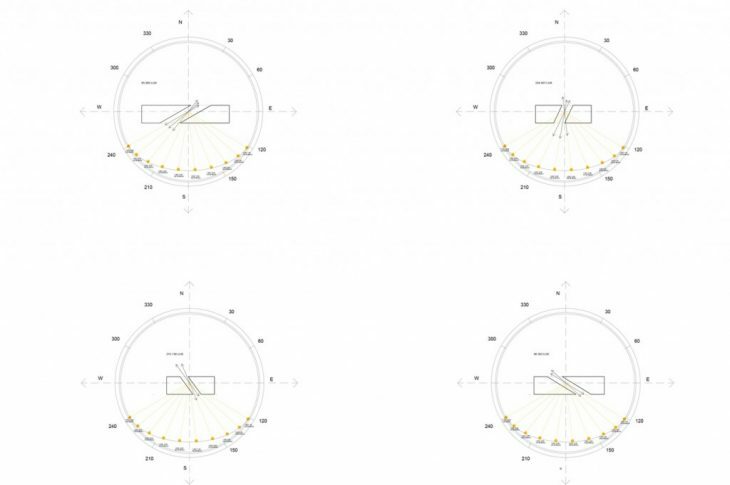 This focused on both 3D Printing reasoning as well as ensuring the maximization of daylight potential, through the capacity of providing the standard amount of lumen intake. From a 3D printing point of view, 3 separate strategies were created. The openings were created for a South-East facing wall, considering that they are the only light sources for a 4×4 meter room, designed for a wall with 4 meters length, 30 centimeters thickness and 3.5 meters height. By considering that an open space hosting a living room / kitchen / dining room is designed, a minimum of 2400 lumen was necessary to ensure meeting architectural standards of comfort. Microperforations are created through a deviation in the continuous trajectory in the toolpath throughout the infill layer print, thus creating an opening. It is a feasible strategy for very small radius openings, but cannot be applied to larger scale ones, since is it creates a structurally weak effect on a larger scale. 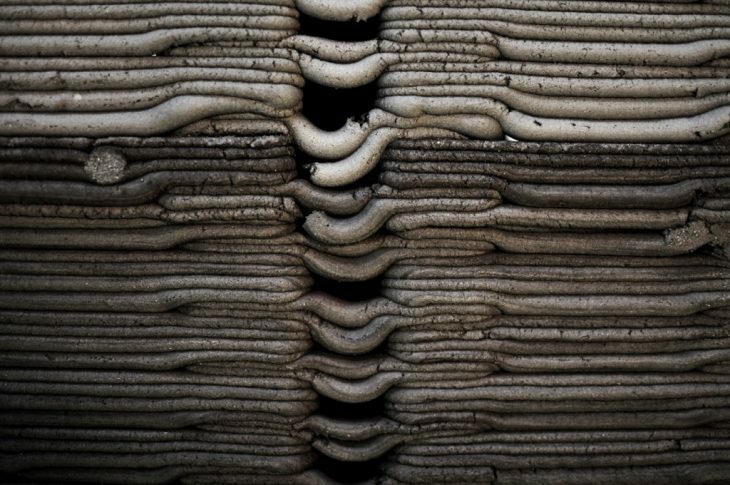 Another property of this strategy is the appearance of the material “drooping”, since it is being printed as a cantilever element, which is an advocate for material behavior, a type of aesthetic possible only with this material and method – thus, highlighting unique features of 3D printing with clay. The openings are multiple and placed in the upper part of the wall, in order to allow as much daylight as possible into the volume during a 24 hour time span. 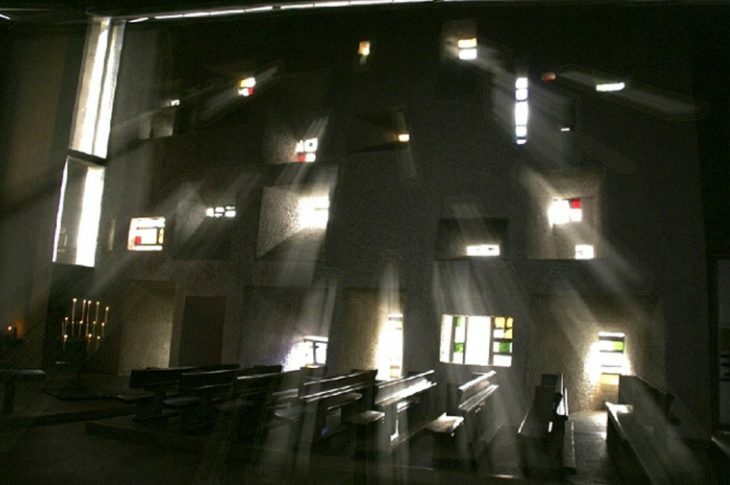 Renowned applications of this include Le Corbusier’s Notre Dame du Haut, and Grand Central Station in New York. Windows are the main developed way within the OTF 2016-2017 research programme that permit the existence of a “through-and-through opening”. This requires the use of the ON/OFF robot command. The result of the ON/OFF/WAIT commands is that the material stops being extruded within the same code of printing. This allows to actually stop printing within the line. However, if the extrusion is abruptly stopped, a cluster of material at the end of the line, hence the WAIT command is introduced, in order to gradually stop extruding. The duration of the ON/OFF/WAIT commands was optimized (0.8 seconds for ON and 1.3 seconds for OFF), as well as the location of the WAIT point (depending on line length, the point is located at a three quarter distance from the starting point to the ending point). Within this exercise, the analysis was developed not only for a straight wall, but also for a curved one. The radius of curvature depends on the radius of the opening increase and decrease which depends on the position of the sun (bigger radius towards sunset, smaller radius towards sunrise). Interior channels are created by designing a specific type of infill, which, as the layer height increases start to come together or apart, thus creating tunnels within the infill pattern. The direction of the openings in plan view is created in order to permit maximum potential of the sun vector, while the direction of the channel in section is created by using ancestrally established techniques that allow winter sun to enter the room, but deflect summer sun to avoid overheating the interior of the volume. Lady Bug for grasshopper was used to test the resulting geometry, and render tests were used in order to visually understand the light patterns. Additionally, solar path visualization was made possible by creating a light sculpture using the robot. The second line of work focused on the way in which light can affect the health, behavior and psychological well-being of people. In “Theoretical Perspectives in Environment-Behavior Research”, Wapner and Demick advances the concept of “person-in-environment”, by underlining that the individual is “composed of mutually defining physical / biological / psychological and socio-cultural aspects, and the environment is composed of mutually defining aspects, including physical, interpersonal and sociocultural aspects”. Thus, is was vital to consider the requirements of the specific environment designed, and its functions, while also taking into consideration the fact that the edifice is designed using a natural materials, applied using state-of-the-art technology. Therefore, the construction is already raising two issues: it faces the user with the primordial, natural side of humanity, as well with latest technological advances, creating a contrast in the parameters of design. While it is very difficult to quantify the precise impact of daylight in humanoid aspects, and would require and extensive research based mostly on sociological surveys to determine a consistent body of knowledge, research has proved how light can affect human behavior. Visual acuity is one important factor that can affect human psychology.Studies also show a link between light and depression: the lack of daylight can affect psychological well-being and lead to severe depression. This is a common problem in places where there is little sunlight during the day, such as the UK or Scandinavian countries. SAD light is a known invention that aims at solving this problem. (“A combination of a change in seasonal light, our hectic lifestyles and the periods of darker days and poorer weather, can result in dramatic effects on our circadian rhythms. As a direct consequence of these environmental and lifestyle factors more people than ever before are suffering from Seasonal Affective Disorder”. 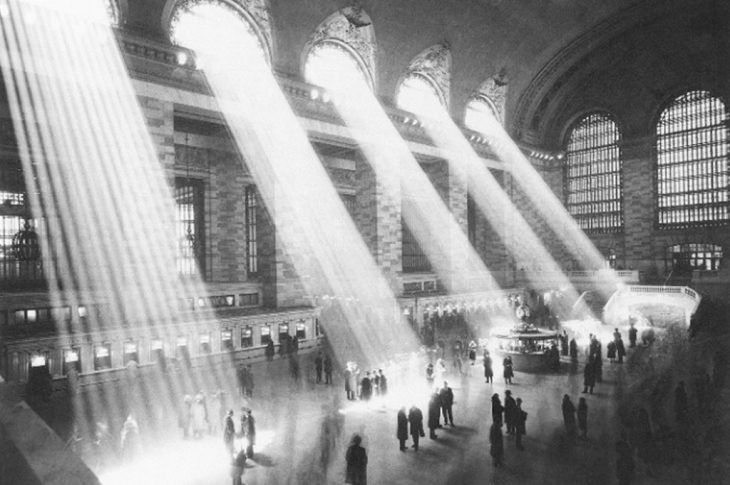 SAD Lights are lights that recreate natural sun light patterns, in order to create psychological tricks which mimic the presence of daylight). Light is also a physical healing element – conditions such as jaundice, otitis, leukemia and many skin conditions are more rapidly cured if paired with light therapy. In order to embed and study all the concepts previously stated, a number of geometries were designed and tested. 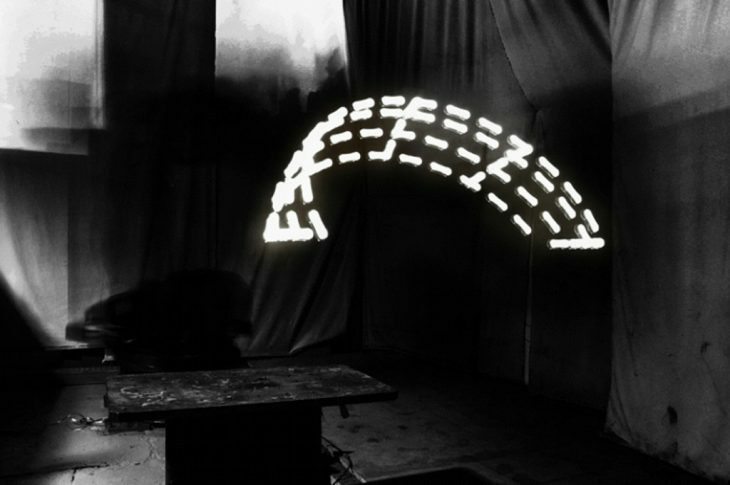 The research started with a straight wall hosting light tunnels, with the infill following vector direction. However, the horizontal openings did not allow to obtain the necessary quantity of lumen. Therefore, in future iterations, it was necessary to explore either create very large openings, either use two vertically superimposed rows of openings. 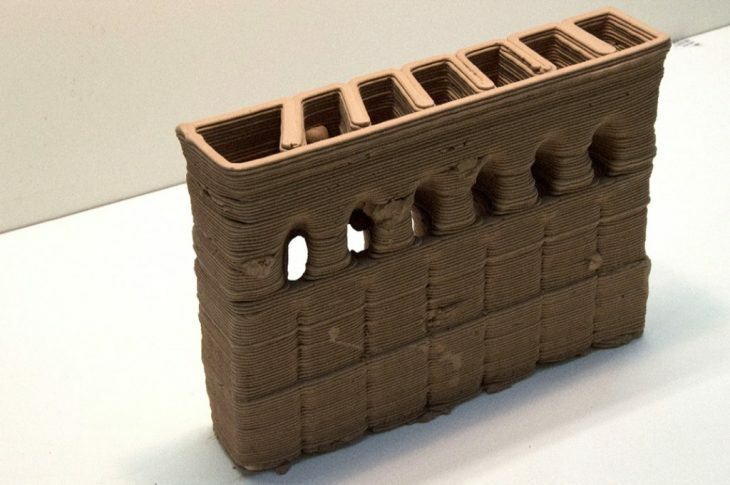 Additionally, a colonnade wall was tested, however this strategy proved to be infeasible when 3D Printing with unfired clay. The digital formal exploration continued with curved walls, and placing the openings both on maximum and on minimum curvature point. The optimum choice, through simulation, is a series of small openings, due to the fact that these can be directed in order to avoid overheating, thus being a stable choice regarding 2 climatic phenomena – daylight and solar radiation.